This month we’re launching microseries, a showcase (albeit a tiny one) for work and poets we love. microseries chapbooks will come out sporadically, will all be very small (the first one is ten centimeters square), will all contain about ten pages of work, and will represent the kinds of things we’d like to publish. They’ll also be affordable—a good way to get familiar with MIEL, our aesthetic, and our production values, if you’re looking to find out more about the press from a writerly standpoint. 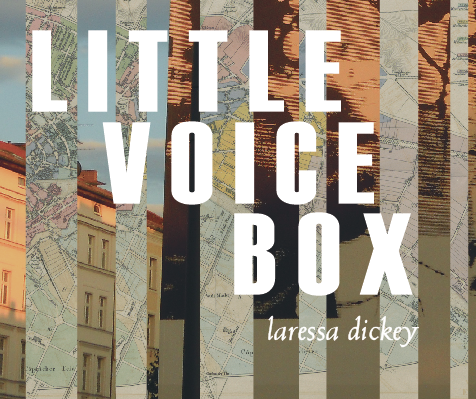 microseries kicks off with Laressa Dickey‘s Little Voice Box, which contains excerpts from a longer work by the same name. If you liked Laressa’s other books, this one is sure to please; if you don’t know her work, it’s a great place to begin. In autumn 2014 microseries will publish its second chapbook—poems by Jonterri Gadson, author of Pepper Girl (YesYes Books, 2012). This June, during our open reading period, we welcome very short manuscripts. Although many of our microseries chapbooks will be solicited, we’re always open to work we don’t know yet.